Attractive Crystal Birthstone Pendant with Rhinestone and 18" chain. Many colors to choose from. 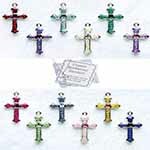 Please choose the color Birthstone you wish to order.